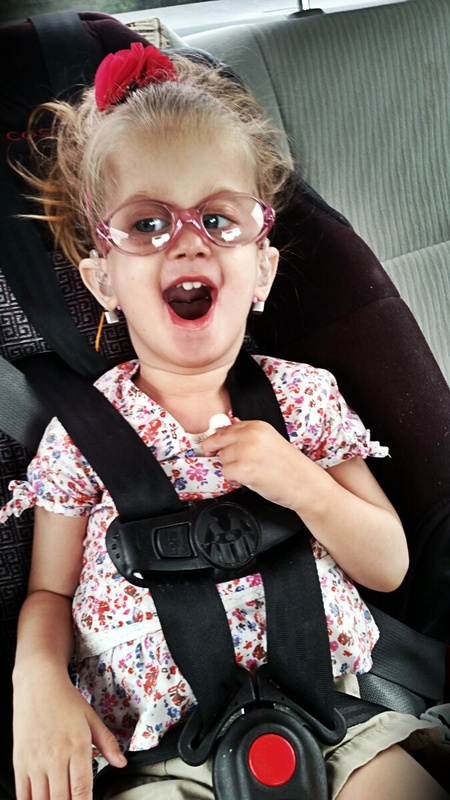 I look down at the face of my “special needs” child, unaware of anything but her sweet smile, and I completely understand why God made me oblivious. As a young girl, I walked down hallways with my nose in a book, running into walls. In Walmart, mom would scold me for wandering off, my attention totally fixated on a tube of lip gloss or a pair of flip-flops. Strangers had to choose another path for their shopping carts as attempts to move past me went unnoticed. I wasn’t trying to be rude. I simply lived in my own world. Life and necessity have drawn me out of that bubble, but there is still a bit of oblivious left. I was pushing Olivia in her stroller the other day, preoccupied by beautiful scenery, when someone asked if she has special needs. It caught me by surprise. She wasn’t wearing her glasses or hearing aids, and the fact that she doesn’t walk yet was hidden by the umbrella stroller. To me, she looked like any other 3-year-old, and while the question didn’t offend me, it did make me wonder how many curious glances I’ve missed. If the looks happen, it’s probably better that I don’t often notice. 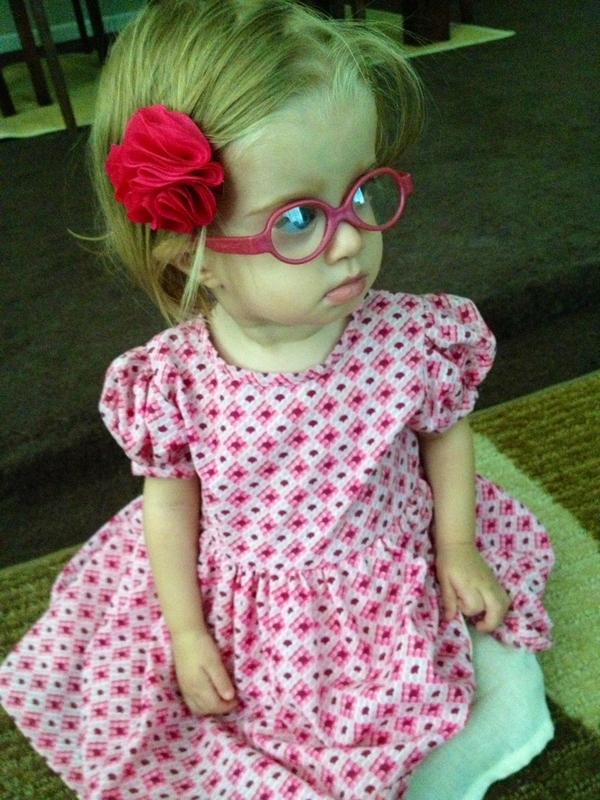 Through her mother’s eyes, Olivia is purely a gift—a bundle of joy and contagious laughter. There is no other person on earth that can make me smile as easily and as often as she can. Yes, at times my mommy-heart aches for my little girl to know the wonder of the sound of chirping birds or the intricacy of a butterfly’s wings. It’s true that sometimes I check for a fever and get bombarded by fear. I find myself praying for healing often, and the petition for grace, strength and faith is a daily one. I do get tired of doctors and hospitals, but I’ve never seen myself as the bearer of any great burden. They mean well, but comments like these puzzle me. They seem startling and out of place in my little world–the one where I am the bearer of this great blessing. Please don’t feel sorry for me. My mind can hardly register pity through the strong sense of privilege that fills my soul. I may not know what it’s like to have a conversation with my daughter, but when she wraps her arms around my neck and pulls me close, there are no words. I’ve never watched my baby take her first toddling steps, but when she feels her way across the house without help and crawls up into my lap, I’ve seen a miracle. I don’t have any funny kid-dialogue to post on Facebook, but the evenings spent just the three of us, laughing because we can’t help it? Those are better than a thousand social media likes. When we find something Olivia truly enjoys—like dipping her toes in a river or a gooey bite of fried cheese—I feel like a rockstar. She snuggles up on my shoulder, not a care in the world, and I remember why there’s nothing to fear. A new syllable is spoken, or a giant red button deliberately pushed, and I can hardly contain my excitement! Olivia smiles knowingly for no reason at all, and I sense the presence of God and of angels too, maybe. Her rare glance across the room and directly into my eyes sends me over the moon with happiness. A burden? Never. She’s a different kind of blessing—one I wouldn’t trade for all of the “regular” blessings in the whole world. Click Here for Olivia’s Story.